How important is our choice of words? An old blind man was sitting on a busy street corner in the rush-hour begging for money. 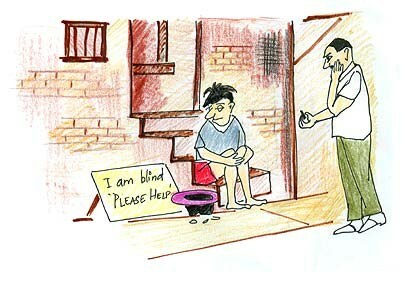 On a cardboard sign, next to an empty tin cup, he had written: ‘Blind – Please help’. No-one was giving him any money. A young advertising writer walked past and saw the blind man with his sign and empty cup, and also saw the many people passing by completely unmoved, let alone stopping to give money. The advertising writer took a thick marker-pen from her pocket, turned the cardboard sheet back-to-front, and re-wrote the sign, then went on her way. Immediately, people began putting money into the tin cup. After a while, when the cup was overflowing, the blind man asked a stranger to tell him what the sign now said. This story illustrates in a timeless way how important choice of words and language is when we want to truly connect with and move other people. Of course both signs told people the man was blind. But the first sign simply said the man was blind. The second sign told people they were so lucky that they were not blind. Should we be surprised that the second sign was more effective?